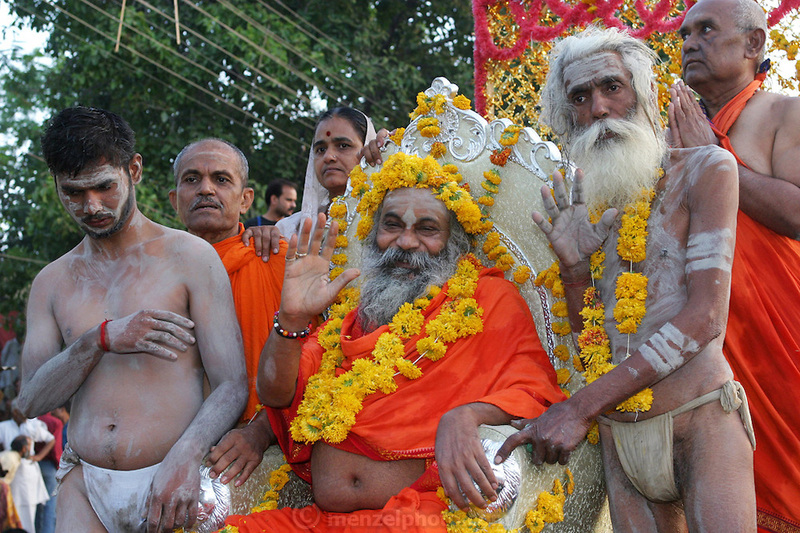 A Sadhu (Hindu ascetics) with his naga followers on a float during a parade during the Kumbh Mela festival, Ujjain, Madhya Pradesh, India. The Kumbh Mela festival is a sacred Hindu pilgrimage held 4 times every 12 years, cycling between the cities of Allahabad, Nasik, Ujjain and Hardiwar. Participants of the Mela gather to cleanse themselves spiritually by bathing in the waters of India's sacred rivers. Kumbh Mela is one of the largest religious festivals on earth, attracting millions from all over India and the world. Past Melas have attracted up to 70 million visitors.